Well, I hope everyone had a fantastic Christmas--I sure did! It still looks like Toys R' Us exploded in my house, leaving red and green paper fragments scattered like confetti all over the place, but that's ok (for now--in a day or so, I'll get to where it will HAVE to be cleaned up or it'll make me crazy!). The girls are still having fun, flitting from one new thing to another. Right now, they are playing "makeover" with Lindsie's new makeup kit. I'm sure even Eric will have glitter on him by the end of the day! Anyway, today is the last Saturday of the year and time for Jen's A Sketch For You To Try. I have been in such a holiday mode, that it was really difficult for me to get anything to "work" for this sketch (as you can probably tell--has anyone seen my mojo?). 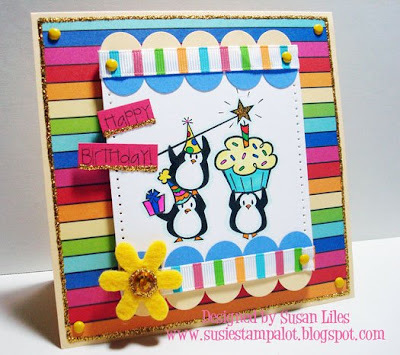 I decided to make this a birthday card for my stamping friend and Christmas birthday girl, Shannan. I had not had a chance to use my little penguins from The Cat's Pajamas, so they were a "no brainer". I love this paper by Scenic Route and was determined to use it. Then I decided to add a bunch of gold Stickle accents to go with all the yellow and that's when it went a little "disco" on me, but I like it and I hope Shannan does as well. Happy Birthday, girlie!! Be sure and check out what the other Funkytown girls have made for the sketch--I'm sure they will turn you upside down, inside out and round and round: Shannan, Carole, Amy S. and Amy R.
SUSIE Q-TIP: When applying stickles to small places (such as the points of the star in this case), use a pin to spread them to the tiniest spots. Love the gold accents and all the color-whoo hoo! I think your mojo is feeling just fine, as is evidenced here, my friend! Hey, thanks for all your kind and sweet comments at IAM! Funkytown? It's totally the Summer of Love! Love the bright colors. This is super duper cute!! So fun, Susan! Love the bright color palette and that awesome dp! Susan! I looooove this! SOOOO FESTIVE! So happy! You did awesome!